ORCHARD PARK, N.Y. (AP) — Bills coach Sean McDermott described the reason the team cut Robert Foster last month as being a wakeup call for the rookie receiver. Looking back, Foster fully acknowledges it was a message received loud and clear now that he’s back on the roster after two days of being unemployed followed by a two-week stint on the practice squad. Evidence of how motivated he’s become was apparent following the formal end of practice. Rather than head straight to the locker room to pal around with his teammates as he did in the past, Foster, first, spent extra time catching passes from rookie starter Josh Allen. He then worked on running routes against a defensive back, before spending yet another 10 minutes catching one ball after another being spit out by a Jugs machine. It’s not that Foster wasn’t doing enough post-practice work before he was cut. It’s more like he wasn’t doing any. The payoff is showing up on the field. 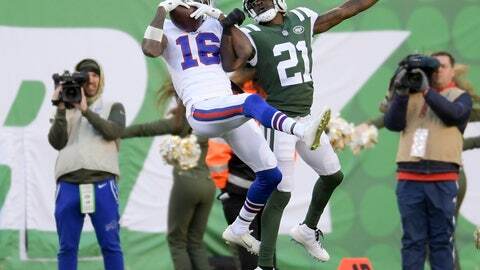 In his first game back on the active roster, Foster caught a 47-yard pass from journeyman backup Matt Barkley on the first play from scrimmage, and finished with three catches for 105 yards in a 41-10 win at the New York Jets on Nov. 11. He became Buffalo’s first player to top 100 yards receiving in 13 months. Foster followed that up last weekend with a two-catch, 94-yard outing in a 24-21 win over Jacksonville which he punctuated with a 75-yard touchdown reception from Allen. The completion was the longest by the Bills since Week 2 of the 2016 season, and longest by a rookie quarterback in team history. Having already learned a lesson in humility and enjoying a rare shot at a second chance, Foster deflected a question regarding his level of confidence. Foster was undrafted out of Alabama, where he won two national titles while seeing limited playing time in finishing his college career with 35 catches for 389 yards and three touchdowns in 19 games. He had two things going for him when it came to signing with Buffalo. The first was his speed. Foster’s time of 4.41 seconds in the 40-yard dash at the NFL rookie combine was tied for third with Antonio Callaway, who was drafted in the fourth round by Cleveland. The second was Foster’s connection to Buffalo in newly hired offensive coordinator Brian Daboll, who spent last season serving in the same role at Alabama. McDermott didn’t mince words when outlining his decision to cut Foster. McDermott was pleased by how the 24-year-old responded. “He’s earning the right to get playing time, and he’s made the most of his opportunities since coming back,” he said. The Bills (4-7), who play at Miami (5-6) on Sunday, have placed an emphasis on speedy young receivers, such as Foster and another newcomer, Isaiah McKenzie, to complement Allen’s strong arm. Whereas at Alabama, Foster was mostly asked to simply outrun defenders, he credited Bills position coach Terry Robiskie for helping him learn to become a well-rounded receiver. Though he’s back on the roster, Foster pretends he’s still on the practice squad to remind himself how close he came to having his career end before it nearly began.